This is a late addition to my July Summer Beverages round-up, but when I saw the post on the Food Network food blog Feeding Frenzy, I had to give it a shot (or two, or three…). Unfortunately their article didn’t give any specific instructions or measurements, so off I went on Google searching for anything I could find on the subject. The New York Times Magazine yielded what I was looking for. In short, you brew the coffee in cold water over a 12 hour period, and the resulting concentrated coffee can then be used to make iced coffee or add coffee flavor in baked goods. (Mocha brownies, anyone?). Apparently this method has been used for years in the New Orleans area. There is even a gadget by Toddy Products to help make the process easier (of course there is). The company claims that cold-brewed coffee has 67% less acid, making for a much smoother taste. I knew that I had to try making my own, however, I didn’t want to invest in a uni-tasking kitchen gadget, so I just used simple gear I already had on hand. All I needed was a glass measuring cup, medium mesh strainer, fine mesh strainer, and a mason jar. If you don’t have a fine mesh strainer, you can accomplish the same task by lining the medium strainer with a couple layers of cheese cloth. You can also do this with a French press if you have one, just make sure that the coffee grind is medium to coarse no matter which method you choose. My first batch of concentrate is almost gone, and I have really enjoyed it. The aroma and flavor is strong and good. The recipe says that you can keep it in the frig for up to two weeks, but I think one week is optimal because the flavor seems to lose its spark after a week. 1. Put coffee in the container. Add 2 cups water, stirring gently to wet the grounds, then add remaining 8 cups water, agitating the grounds as little as possible. Cover and let steep at room temperature for 12 hours. 2. Strain coffee concentrate through a medium sieve, then again through a fine-mesh sieve. Store concentrate in the refrigerator for up to two weeks, though I recommend using it up within a week. 1. Put coffee in the container. Add 1/2 cup water, stirring gently to wet the grounds, then add remaining 2 cups water, agitating the grounds as little as possible. Cover and let steep at room temperature for 12 hours. The writer of the NY Times Magazine article obviously likes his coffee strong because he uses 1/4 cup coffee concentrate to make his iced coffee. I tried it that way at first and found myself adding more milk and ice. For me coffee is dessert and should be enjoyed with milk and sugar, even caramel sauce or chocolate sauce…but I digress. So I just use just a 1 ounce shot to get a nice cup of iced coffee with milk and some sweet stuff. If you want your coffee warm, heat 3/4 to 1 cup milk, then pour into a mug and add desired amount of coffee concentrate. I made the iced coffee also (http://prissycook.blogspot.com/2007/07/keeping-cool-with-ice-brewed-iced.html). It was delicious and STRONG. It was a bit of a mess transferring between strainers, don’t you think? thanks for the recipe. 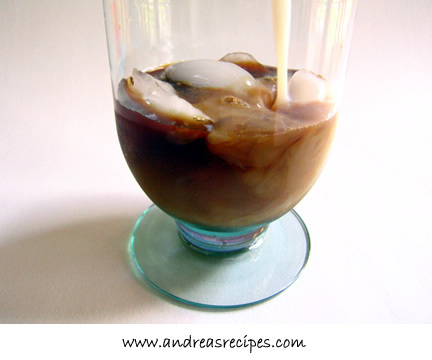 I think I’ll try it this week…..perfect weather for ice coffee! Andrea, this is lovely! I am a coffee addict. Must try this soon! Steamy & Ahn: Thanks! I’ve found this is a yummy way to get my coffee fix. It is stronger than I can make, and delicious. I came across your post looking for instructions on how to cold brew coffee. I have a 3 month old and unfortunately am turning into a caffeine addict. I’m wondering about the strainers (which I don’t have and would like to avoid buying) – couldn’t I just use a coffee filter to separate out the grounds? Hi Shari. Yes, you could use a coffee filter. If you have a traditional basket type coffee machine, you could put a filter in the basket, pour the coffee mixture in, though you may have to do it in batches, and let the concentrate drip through into the coffee pot. It takes a little longer than using a mesh strainer, but it does the job well. Andea, do you mean when you say 1 pound of coffee, 16 oz, or one bag? as a bag has only been 12 oz around my part of the country and is the standard size for mail order vendors. Hi Brian, thanks for visiting. Yes, 1 pound/16 ounces. If you want to use 12 ounces of coffee, then just add 7-1/2 cups cold water.